TM Onsite Onepage is a sleek, clean, fully responsive and perfect horizontal onepage responsive bootstrap template. This multi-purpose design can be used for any type of websites like corporate, agency, nonprofit, consultant agency, freelancer or general business or small business. Also when your company needs to inform the public about your latest product or mobile app a one-page website is a great solution for such an announcement. 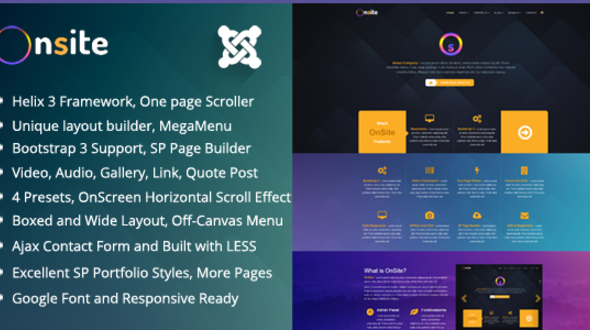 Onsite is a responsive One page template for Joomla 3.4.3. It runs on our brand new Helix3 Framework with tons of backend customization config options. It gots a fullscreen slider with custom page captions, an Awesome portfolio and contact form, a blog and 4 different styling options. It comes in 4 presets and an interesting new module ET Ultra Slideshow module, which you can see in live action as onepage section on the demo site. Great for – small business, portfolio website, product page, marketing purposes, personal trainers etc.